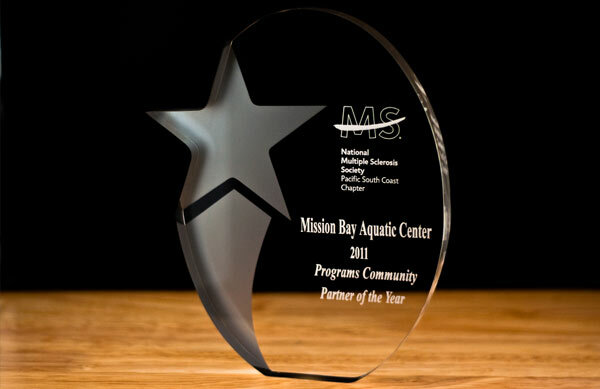 The Southern California Chapter of the National Multiple Sclerosis Society (NMSS) has awarded MBAC the Program Community Partner of the Year award. For 10 years MBAC has partnered with the MS Society to hold an event for persons with MS to enjoy a day of sailing on the bay. Each year for the past decade MBAC and the MS Society have teamed up to hold an event whose purpose is to offer persons with MS and their families an opportunity to participate in sailing, an activity that many with MS may not otherwise have had access to. The event was the brain child of a former MBAC employee Bruce Rifkin, who was diagnosed with MS while he was working at MBAC, and Karen Hooper at the NMSS. The two had a vision of for an event that they dubbed The National MS Society All-American Day at the Bay. Since then the event has grown in size over the past decade and now hosts over 250 persons with disabilities and their families from across Southern California. This year is the 11th annual and will be held in May. The National MS Society as an organization is a collective of passionate individuals who want to do something about MS now—from improving the lives of persons with MS, to working toward a world free of multiple sclerosis. For more information about the National MS Society, or to make a contribution that can help support programs like Day on the Bay, visit www.mspacific.org.